Battery sleeper cells: Will you be canceling your Note 7 order? Samsung just issued an official statement about those faulty Galaxy Note 7 production units, saying that it is putting the phone's orders on hold to determine which batches have been affected by a batch of rogue battery cells that has slipped through the supply line quality checks. It owned up to the problem, saying that out of about a million units moved so far, just 24 have been identified as problematic, yet everyone who owns one will receive a brand new replacement if they wish, it seems. Still, for those who preordered, and are waiting on their shiny Blue Coral version to arrive, the announcement that the shipments are placed on hold to isolate the troublesome batch and take it out of circulation must be pretty disappointing. The Note 7 had its official launch in Europe pegged for today, for instance, but now it seems that it will be moved down the line, possibly with a couple of weeks even. Granted, the Note 7 is a handset worth waiting for, but given the cutthroat competition in the Android and iPhone universe this season, some might be tempted to look elsewhere until all of this is resolved. That is why we wanted to ask you if you are thinking of canceling your Galaxy Note 7 order, or don't mind waiting a bit longer to get it. Tell us in the poll below. 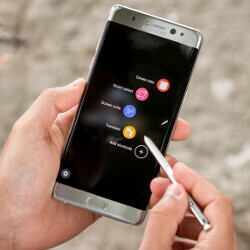 Will you be canceling your Note 7 order? Well, many other OEMs have had defects in their devices. Samsung has done great by owning up to the issue, and Sammy does not put the blame on the consumers, unlike Apple withs the "you're holding it wrong" excuse. There was a report about an iPhone exploding in a man's pocket in Atlanta. I imagine what Apple could say about it: "He was pocketing it wrong and he was wearing his pants wrong". Lulz. You're charging it wrong. Anyway, we'd like to solve this issue by sending you a rubber case that will reduce the burn damage by 0.2%. That's kinda true tho, you shouldn't use 3rd party chargers that haven't been certified by Apple. I know a cheap charger shouldn't cause your phone to exploded but if it isn't certified you only have yourself to blame. Sammy is still blowing it out of the water with the way they are handling this problem, gotta give credit where credit is due right. I'm an HTC 10 owner but I think it's commendable that Samsung has owned up to the issue and taking steps to resolve, as opposed to telling folks to hold the phone different and sending out rubber cases. Their stock is going to get hammered, and they may not sell as many Notes, but they'll be fine. First amoled display burn in now whole device burning whats the matter samsung. "To date (as of September 1) there have been 35 cases that have been reported globally and we are currently conducting a thorough inspection with our suppliers to identify possible affected batteries in the market. However, because our customers’ safety is an absolute priority at Samsung, we have stopped sales of the Galaxy Note7." I bet other companies will just sweep it under the silver rug if they have problems like this. I applaud samsung for having corporate actions like this. 35 phones out of millions sold. Compared to the iPhone 4 where the design affected every single model. Unlike the iPhone 6 Plus bending, which was a design flaw for millions of users. But here come the hypocrites. Not on quality control comment from the fans. How many iPhone have caught on fire? More than any Samsung combined. They are just mad and jealous that Appel won't even have a phone at the top of the charts ever again. Oh and here is what history has shown us. When a company steps up and admits there is an issue, does what it can to remedy the issue and protect its customers; the sales of the next model tend to go through the roof. Even if they do a global recall, unless my explodes, I will be keeping it. My phone hasn't even gotten hot while charging. No warmer than normal if I use it while charging and I still have my Note 5. All I have to do is move my SIM card. Samsung may do a global recall, they may not. According to the facst I gathered, they are confirming that the models that did explode are bearing this defective battery. if so, they simply have to isolate which items have the battery and where they were shipped too. Samsung is talking with VZW mostly which appears to be the only US carrier so far who may possibly have a phone with the defective battery. I rather they be safe than sorry. At least no one has been injured or killed. Samsung is doing the right thing. They aren't trying to muzzle the press. They have publicly announced the issue exists. Not what many other OEM's like Apple have done. It may land them some bad press from the hater writers of PA, it may land them some bad press from the Apple fanboy/Samsung haters club; but doing the right thing is what matters. I'm glad they are taking care of it. Won't change my buying decision. I will still buy their products as long as they remain the best. My Note 7 works perfectly. It's sad many users have gotten an unsatisfactory experience. But at least Samsung isn't trying to hide it from the public like Apple does by deleting post and putting a gag order on the media. For this move, Samsung should be praises for stepping up and doing the right thing. I dont care about the trolls. They will never change and I'm not gonna go into hiding liek they do. Touch Disease effects 100% of all iPhone 6 models do to poor quality control and a poor cheap design. The fans have swept it under the rug. Appel is being sued for not doing anything, and there isnt even a chance of injury or explosion. HAHA! This is why I can hold my head up and proudly show off my Samsung. Samsung isnt being sued and they are taking steps to insure they on't be. How many times has Apple been sued for not taking care of their customers? I know of 10 incidents. Issue with the Mac G4 - Not using heatsinks Issue with the PowerBook - Not using heatsinks iPhone 3GS paralyzed by firmware upgarde iPhone 4 - Antenna issue where Apple tried to sell the fix as an accessory because they knew about the issue. iPhone 5 - arriving in boxes bent and damage iPhone 6 Plus - Bending in people pockets, damaging the battery and catching on fire and cause serious injures iMac shipping and arriving damaged and not working, with replacements taken more than a month to receive. iOS9 causing peoples phones to stop working. Even after 10 updates people are still having issues. My iPhone 4 S is totally unusable. It constantly freezes, and crashes the very few games i have on it for no reason. Can't downgrade to a working firmware because apple wants me to buy the newer model. iPhone 4S discovered to be stealing peoples data and Apple got sued for it. Google how many times Apple has gotten sued vs Samsung and Samsung is a much older company. Apple has been sued every single month this year so far. Next issue. Sales the iPhone 7 will drop by as much as 25% YOY compared to earlier models. We will see what the fans be saying then. Idiot stop writing those meaningless essay. You are an idiot hillaryisacriminal. Samsung did a great jobs stepping up to control the issues for the safety of it cunsumers instead of ignoring it like Apple. 3 battery explodes in July alone and was there any steps they took? How about man died back in February because his home burn down from charging his iPhone? Get a life dude! Yes hillary a criminal is a idiot well said. Not too long ago...1st Aug 2016 http://www.cnet.com/news/iphone-6-explosion-leaves-man-with-third-degree-burns/ "Clear has spoken with Apple about his injury, and now wants to share his story. "The more pervasive these are in our lives and the more people use them with a lack of apprehension that something might go wrong, the more that these things will happen," he said. "I want Apple to investigate, find out what was the cause and we need to educate people about this." My comment; good luck to him and his wish on Apple. That means 1100 + samsung note 7 users are at risk . Damn! Very small numbers than the ones at risk for Touch Disease! Must smaller than the number of people who had iPhone 4 issues. Way less than the millions of people who had their phone bend for no reason Funny though, no one has been injured. Can Apple say the same? How many people have been burned by their iPhone? LOTS. Samsung? NONE! troll harder and maybe you will have some success at it! You will because the carrier/retailer will replace the device under warranty. You just have to pick something else, unless you want to wait for replacement which we don't know when that will happen. You could have just kept it until you heard the final move by the OEM. if Samsung has indeed confirmed that the only model potentially affected are the ones with the battery from this one vendor, then that means all the rest of the phones will be fine. The recall would mean returning the phone for it to be confirmed which battery si inside. if you don't have the defective battery, then your phone will be given back to you. I'm keeping mine. If it was a widespread issue, everyones Note 7 would have exploded right now. So far it has not been confirm it it affects the NA/SnapDragon variant. It so far only effects the Korean/International Exynos model. It does not effect all Exynos models. 35 known cases is a very small number as iPhone fans would say. It affects 0.1% or roughly 500,000 phones with 400,000 of them having been sold in Samsung home country. I did cancel mine, but was due to the unoptimized SD820 coming here in Canada. I'll be ordering the international version later in 2017...unless the S8 reveals something very attractive and worth waiting even longer for in the Note 8. Almost in same boat here, international version is too costly right now and it's on pre-order anyways. Last year note was selling for 550 in mid November. I will be buying when price id exynos note 6 drops to 600 on ebay. What? BS. There is nothign wrong with the SD820 model. It is optimized. What you dont seem to understand is Qualcomm optimized the chip to be like desktop capable. Its all about power and not begin efficient. I have both the International and SD820 variant. The only thing iZ notice is, the SD820 has a slightly higher battery drain under load and while sleep. In 15 minutes the phone lost 10% of its charge compared to the Exynos model losing 5%. The SD has always been optimized to give better performance. This has been a fact of the SnapDragon since day one over other chips. Because of the performance boost, it means more power being consumed. Other than this, I have notice nothign different about the 2 device. They bot get equally ot under load, but the SD version is less efficient and drains more power. To deal with it, I lowered the resolution on the SD variant to 1080p. Now they both drain at the same pace. I think you're just using it as an excuse because you're paranoid :-) I don't mean that in a bad way. You are one of the most consistence non-trolling people here, unliek the rabid dogs on this site. Samsung & Apple have got balls to address customer concerns. I wouldn't worry and get the replacements than buying some phone from a brand that I'm not sure will exists at least till the end of the 2 year contract.